Ads by Obrona BlockAds is the label of various pop-up advertisements, web banners, and coupons that are displayed by an advertisement blocked called Obrona BlockAds, also spelt Obrona Block Ads. Judging from the name, you may think that this program is very useful; however, the truth is that Obrona BlockAds is sponsored by third-parties, which means that the program displays some third-party advertisements. 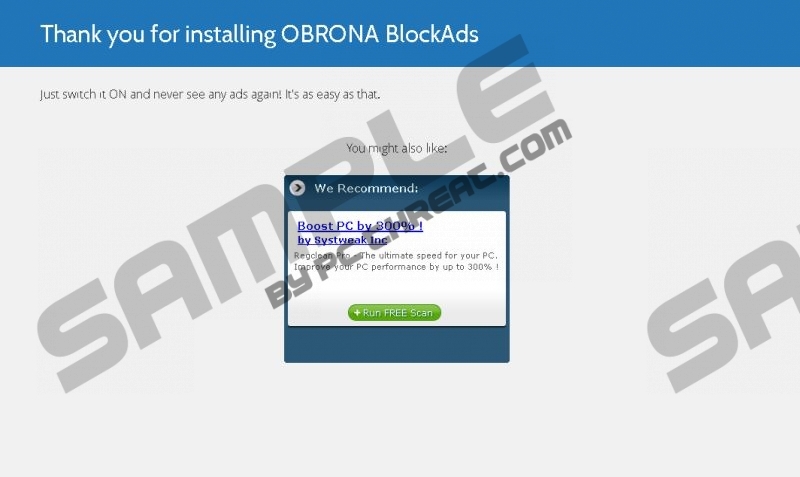 Due to this characteristic, you should not install this program but, if you have already done that, remove the program displaying Ads by Obrona BlockAds pop-ups. Advertisements containing the label Ads by Obrona BlockAds vary greatly due to the fact that the adware program is sponsored by multiple companies. Ads by Obrona BlockAds pop-ups may invite you to play online games, take part in a survey, scan the computer, etc. Some of the advertisements displayed by the adware program may belong to insecure websites, and you should know what you interact with those Obrona BlockAds advertisements at your own risk. The developer of the program accepts no responsibility for third-parties, including their activities and privacy policies. You use the program at your own risk, which is why we recommend that you remove Obrona BlockAds from the computer as soon as you can. The adware program displaying Ads by Obrona BlockAds web banners and pop-up may be monitoring you. It may records your IP address, clicks, impressions, search terms, browsing history and other non-personally identifiable information. The data collected from your browsers may be used to produce various advertisements and improve the program, and, if you want to prevent contextualized ads, you should remove the adware program from the computer as soon as you can. Below you will find our step-by-step instructions which should help you rid the browsers of Ads by Obrona BlockAds pop-ups. However, you should be very attentive when uninstalling the program in order to prevent additional programs. If you do not uncheck the boxes provided by the uninstaller, some new program may be installed. It could be SecurityAndShoppingAdvisors or some other suspect software. In order to minimize the risk of getting the computer affected by undesirable programs, you should rely on a reputable spyware and malware prevention program. We recommend using SpyHunter because this security tool can eliminate Ads by Obrona BlockAds pop-ups from your browsers and safeguard the system against multiple threats, including browser hijackers, adware programs, rootkits, ransomware infections, and fake anti-virus programs. Quick & tested solution for Ads by Obrona BlockAds removal. Yup, it will not go away. What do I do now? I continues to reinstall itself.